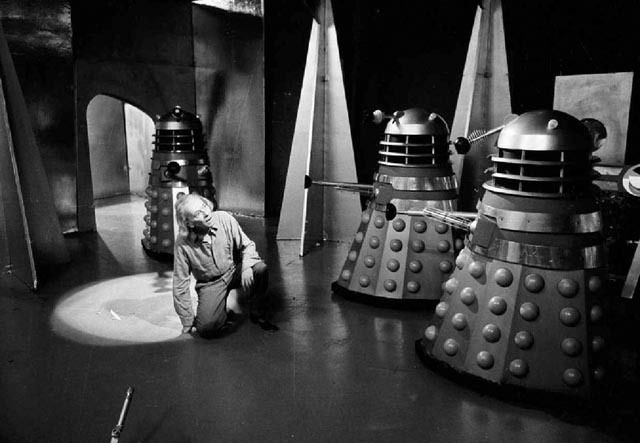 William Hartnell, the one, true Doctor Who, faces his longest running foes, the Daleks. Fifty years ago today (the day after JFK was assassinated), as a nine year old boy living in a small village in southeast England, I sat down after what we then called “tea” (our evening meal) and started watching a TV show I knew nothing about. It had several characters in a blue police phone box who strangely found themselves confronting some cavemen in the prehistoric past. This was the birth of Doctor Who, now possibly the longest-running dramatic TV show in the world outside of soap operas. Although that’s such a long time ago now, I think I might have been more engaged by the show’s innovative electronic theme (written by Ron Grainer, who later did the theme for The Prisoner, and created by Delia Derbyshire of the BBC’s “Radiophonic Workshop”) and its (by today’s standards primitive) video titles. I was intrigued enough to tune in the second week (though I remember my father being rather contemptuous of that first show). The initial storyline lasted four weeks and was reasonably entertaining. Then, in the fifth week, the Doctor and his companions jumped into a distant future on another planet where they encountered a mutated alien race which lived in a metal city, each sinister individual contained within a mobile tin can armed with a death ray. Now here was something that bit into that nine-year-old boy’s imagination (and the imaginations of every child in the country). Suddenly the BBC series was a phenomenon. But the creation of the Daleks by writer Terry Nation caused some problems among the series’ creators (including ex-pat Canadian Sydney Newman and producer Verity Lambert), who had seen the time travelling Doctor’s role as an educational one; sci-fi horrors were just a bit tacky. The BBC, however, saw where the money lay and, although the show continued to pay “educational” visits to the historical past, it was the much more engaging journeys to the future and other worlds that kept us kids watching, and gradually that became the lasting legacy of the series. I watched the show faithfully for three years (and back then, it ran almost year-round), but then we emigrated to Canada and I lost touch with it. By the time I encountered it again years later, there was a different Doctor, it was in colour, and it looked really cheap and kind of silly. I guess I’d grown beyond it by then, or maybe it really did no longer have the enthralling qualities of those early years. It certainly seemed somehow jokier compared to the often rather grim storylines of the original series. For me, it was never possible to accept those substitute Doctors. There could only be one, and that was the cranky, irascible William Hartnell, a great character actor who was already into the thirty-first year of a very busy career by the time he played the Doctor. Even Peter Cushing, as fine an actor as British film ever produced, seemed all wrong to me in the two features based on Terry Nation’s original Daleks serials, Dr. Who and the Daleks (1965) and Daleks’ Invasion Earth: 2150 A.D. (1966, both directed by Gordon Flemyng). I guess I should take a look at the rebooted series which was launched in 2005, but I know that whatever it is and however well it may be done, it still won’t really be Doctor Who for me (just as there’s never been a genuine James Bond since Sean Connery turned in his 007 ID … and let’s not even talk about what came after the early demise of Star Trek in 1967). 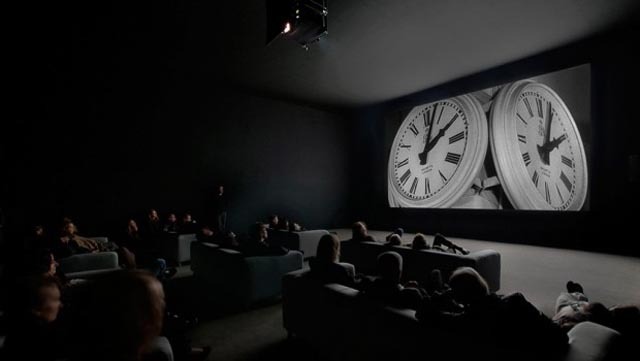 Speaking of time: the Winnipeg Art Gallery had a panel discussion yesterday evening about Christian Marclay’s award-winning installation The Clock to accompany the second of three full, 24-hour screenings of this collage which takes thousands of film and television clips to create an on-screen history/commentary on our relationship with movies and the nature of actual and perceived time. The panel was interesting, though I hadn’t actually sampled the installation yet so only had a general idea of what the speakers were referring to. Of the three panellists, the most interesting in this context was the artist Dave Dyment, who himself had almost completed a work based on the same ideas as Marclay’s when The Clock was first unveiled, suddenly rendering a couple of years’ effort redundant. After the talk, I went up to the gallery where I had to wait a short while before being allowed in as Marclay’s rules for the screenings limit the number of spectators to 65 (who sit on a collection of three-seater couches facing the large screen, imposing an interesting social aspect to the experience; unlike the usual rows of seats in a theatre, the couches impose a kind of intimacy on strangers forced to sit so close to each other in relative isolation – I had a very uncomfortable hour with a couple who were not willing to make sufficient room for me). You walk in on a “show” in progress, stay for however long you feel like, then walk out as the show continues without you. Not every shot or clip actually displays a clock on screen, but whenever a clock does appear, it displays the exact time you’re watching it. My initial experience, orienting myself to the flow of fragments disconnected from narrative, was slightly irritating. The brain looks for order and progression, but the more or less random flow leaves nothing to grasp. I actually felt an abrupt sense of relief about five minutes in when I recognized Edward Judd walking into the large, noisy newspaper printing press in Val Guest’s The Day the Earth Caught Fire. I could situate the clip in my own memories of the film (a favourite) and although, like all the others, it passed quickly on to something else, I felt that I was now engaged. The next thing I noticed a few minutes later, during a section which covered a single minute of time with a long series of images showing clocks displaying that particular time, was just how long a single minute could feel when you focused on its passage that intently. It was a reminder of how a minute of screen time usually seems to encompass a longer period – movies are about the compression of time as much as anything else. By forcing the screen to play out every second, Marclay made that minute seem almost interminable. Because you quickly become aware of the obliteration of narrative in the collage, you have to start finding other things to maintain your attention. Yes, whenever something familiar shows up on screen, you tend to fill in the space around it with missing pieces of the remembered narrative, and as the assembly occasionally returns repeatedly to a particular film (the part of the day I was watching included a series of clips from Otto Preminger’s Laura, specifically Mark’s discovery of the shotgun in the grandfather clock, his warnings to Laura, and Waldo Lydecker sneaking back into the apartment to kill her, only to be killed himself … all “uncompressed” to play out in real time, repeatedly interrupted by numerous other things), your mind strains to impose a sense of narrative which remains stubbornly out of reach. You want all this material to build towards something, but any dramatic destination is perpetually postponed. You can play the game of identifying the clips (a friend estimated that he could manage about 30%; my rate was much lower), or identifying the actors – that frustrating effect of knowing you’ve seen someone before, but being unable to place them, aggravated by having them disappear so quickly. Strangely I found there were stretches where I actually forgot about the on-screen clocks (they’re sometimes in obscure parts of the frame), concentrating on other elements of the image. I seemed to have the peculiar ability to identify a film as French merely from the look of an actor’s, or more often an actress’s, face; but for German clips I had to wait until someone spoke before I could tell the nationality (do Germans look more English than the French?). As an editor, I suppose the thing that engaged me most closely was the actual cutting and The Clock is, if nothing else, a remarkable display of the art of editing. The ways in which Marclay binds one clip to another, the exchange of looks across films and decades, the perfectly timed response of a character to something which has just happened in a distant fictive universe, is exhilarating. This gives The Clock a flow, a coherence, which has nothing to do with narrative but everything to do with the way we watch movies. What the installation foregrounds is the idea of a cinematic space which is completely separate from physical space, making the spectator realize that while movies photographically represent actual space, what they really present to us is an imaginative space which is endlessly malleable. Marclay, primarily a sound artist, uses a sophisticated sound editing technique which doesn’t remain tied to the individual clips; audio from one clip bleeds over into another, increasing the sense that characters are interacting across movies; music often binds a series of clips into an illusion of narrative coherence which then suddenly dissolves into something else. The work functions on both visual and aural levels so you can close your eyes and create images in your head from what you hear. I had originally intended to try and stay for two hours (I was already tired by the time I got to the WAG and had to be up again early this morning); but the longer I sat there, the more my sense of time – or rather duration – transformed. From that early, almost excruciating sense of duration, I settled into the flow of the performance and (of course having no need to glance at my watch to see how long I’d been there), I’d look at the clocks on screen and think, okay, I’ll give it another fifteen minutes just to see what might come up; then I’d think, maybe I’ll stay until the next half-hour mark. By the time the clocks on screen said it was eleven, I shrugged to myself and thought I might as well stay to see what happens at midnight. In the end, I was there for about three-hours-twenty-five-minutes. And by then, it no longer felt as if much time had passed. The nearest thing I can compare it to is a long road trip, driving hour after hour; in both cases you’re in a position of simultaneous movement and stasis – the world is flowing around you, but you sit immobile in your seat. Time is no longer a matter of forward movement; you approach that zen-like state of existing in a single endless present moment. If I hadn’t felt the external pressure of needing to get home and get some sleep before all the things I had to do on Saturday, I could have sat there for I don’t know how many more hours, just feeling time wash over me. And when I woke this morning I was dreaming of a huge digital clock display which, for some reason, was showing 11:54. This entry was posted in Commentary, Review and tagged British Television, Film Criticism, Film History, Science Fiction. Bookmark the permalink.